It's all about what you're interested in, and what matters to you. Some great players like pristine instrument, some collectors like roadkill sloppy seconds from the 1950s. It's all good it you let it be. chris101, pteropid and Hoseki like this. ...some collectors like roadkill sloppy seconds from the 1950s. But first you have to know that is good sounding. And how hard is to find one. There is not perfect guitar. What is perfect for you, does not be have to be perfect for me. And every guitar company is making lemons. Some more some less. A lot of pople will dismiss Premium Jem only because it is Premium not Prestige. But everyone has right to their own opinion. pteropid and Hoseki like this. Ultimately the way a guitar sounds and feels should be the most important thing to you. No sense playing a beautiful guitar that you otherwise don't like. But that has absolutely nothing to do with what you should expect in the fit and finish of a brand new guitar costing $3000 (MIJ) or $1800 (Premium). Considering that the two models are close to identical on paper, the minute differences of what you get for a 67% price increase are very important. pteropid, sepulchrave and Hoseki like this. I like both! After all if you spend a fortune on a nice looking guitar, why not keep it looking nice - but if you want something that's always on hand to pick up and play, get knocked over by rampaging kids or bashed against a wall, then a nice playing beater that you wont shed any tears over is perfect. Posh guitars in cases don't get played as much as the should do (at least in my house), but its always reassuring that you'll get a good return on that looked after investment if you hit hard times. This JEM7VP thing has affected me very personally! In the summer of 1989, the year I graduated from High School, I put a 1988 JEM77FP on lay-away and took a summer job to pay it off. It has been an absolute treasure for all these years, and I love it with all my heart. I own a few other Ibanez guitars, including an RG770DX, a UCEWFMTB, a Talman, an RG471AH, and a JEM70VSFG. It was the thought that the MIJ Prestige JEMs might go away that drove me to buy a brand-new JEM7V. And it's absolutely flawless. It's right up there with the JEM77FP, RG770, and the USA Custom in its sensitivity and expressiveness. I realized there was a debate starting about these instruments, and I feel I settled the issue the best way I could. Very thankful that I was able to do so. I have pictures and thoughts about the instrument beyond this post, but I need to find the right thread to share them! Last edited by Dr. Faustus; 02-13-2019 at 09:00 PM. Reason: Page snipe! I hope this means you're planning on starting a JEM-FP page so I can see the pics and tell about mine too. Love all the JEM's, but the FP is a very special instrument and always will be. 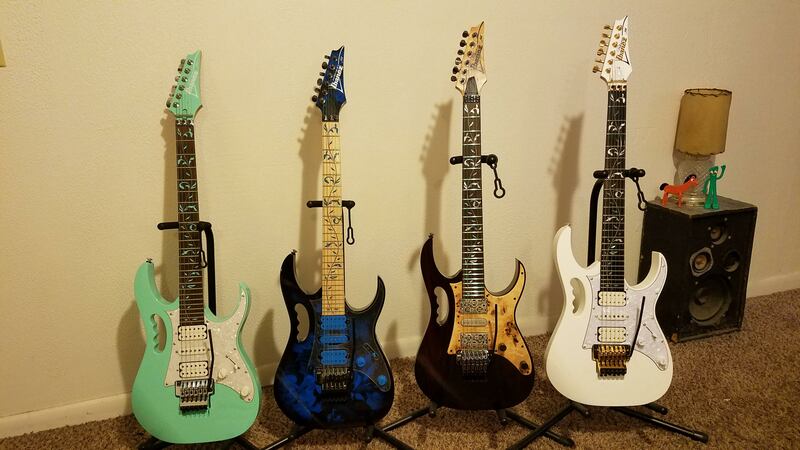 I would very much love to share pictures and stories about my three JEM guitars, and I would also love to post and share about my other very special Ibanez guitars. Not sure where the best places to do this would be as this community seems to be well-moderated and I don't really know all the rules. I would be happy to either join or start a discussion about JEMs, but I very much have a special appreciation and connection with my old JEM77FP, so I would happily focus on that. I own a JEM70VSFG that has a bit of a story to it that others might have common experience with (it wasn't perfect, but Hoshino USA made it so). My new JEM7V is just a magnificent addition to my house that is probably causing all my other guitars to feel "some type of way." As amazing as it (the JEM7V) is, my 1988 JEM77FP will always mean the most to me. It is followed closely by a couple others which have their own unique histories and significance. Those would be my RG770DX and my USA Custom Exotic Wood (Flame Maple Translucent Blue) that I also would love to share. I have modded all but the new JEM7V to my own personal taste in electronics, though; and that may not be very welcome for purists. And to put it mildly, the JEM77FP and the RG770DX have not been coddled as collector's items. They have been my foundational instruments and they have been through so very much, and they bear all the scars to prove it. Sorry if this post is off-topic! I'll happily accept any guidance in what to share and where. 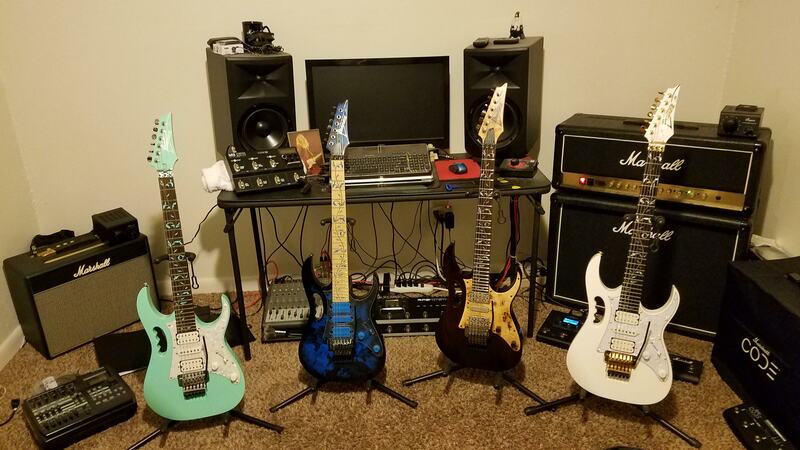 I have had friends with extensive Ibanez collections and memories, and these JEM/RG guitars just happened to hit the market at a time when I needed them to save me from - other instruments. jono, Elliot Twist and Hoseki like this. Just go ahead and start a thread about your JEM's. No one cares, or at least they shouldn't unless you've done something to your collectible JEM like I have. Anyway, they're our guitars and we get to do whatever we want to with our own guitars. jono, GearBoxTy and pteropid like this. Last edited by Hoseki; 02-17-2019 at 11:52 AM. I am a complete Ibanez fan since 1974. Ibanez has 4 Indonesian JEM Guitars. I have all 4. In '93 I bought the 7V for $1700 and played it 4 nights a week in a working cover band for 10 years. It sold in 05 for $1500. It was worn out. I never liked the 430mm Radius neck, but it was a quality instrument through and through. All these Indonesian JEM Guitars are my favorites. It's the 400mm Radius for me. I love the fact that Ibanez brought back the Ebony for the 7VP. This Guitar sounds great to me, as do the other 3.
jono, peromucho7, Formerly Given To Fly and 1 others like this. As a collection of guitars that simply looks amazing! I'm more and more tempted by these Premium JEMs!!! I have not had a problem with the Ibanez Premium line. Always disappointed that "outa the box" all my Indonesian Ibanez guitars needed to be taken to a guitar Luthier @ around $100 each guitar. ...but once done they are fine for life. I can do most of it myself, but don't choose to. Lay's Guitar Repair in Akron, Ohio does what it takes for me. The funniest thing is that any and every time I pick up one of my 2009 RG370DX guitars it's perfect and plays flawlessly. One of them is setup for Drop "D". The pups on the RG370DX are questionable, but I play Marshall tube heads, and it works out for me.